In a large mixing bowl, add the grated carrot, chopped walnuts, sultanas, sea salt, baking powder and brown rice flour and mix till combined. In a separate mixing bowl, beat the eggs then add the vanilla powder or bean paste and mix into the dry mixture until thoroughly combined. Then pipe into your 12-hole donut tray ¾ of the way up. Bake in a pre-heated oven on the middle shelf for 20 minutes. To make the cream cheese frosting, in a mixing bowl add the cream cheese together with the custard powder, agave nectar and lemon juice. Beat until smooth. Place into a piping bag and leave to chill in the fridge. 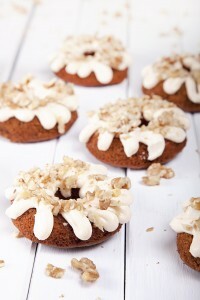 Remove the carrot cake donuts from the oven after 20 minutes. After 5 minutes carefully insert a sharp knife around the edge to release the donuts. Leave on a wire rack until cooled. When the donuts have cooled, pipe the cream cheese frosting on top and sprinkle with a touch of cinnamon powder and chopped walnuts. LISA’S TIP – If you want to keep this dairy free, you can use dairy free cream cheese.